Move oven rack to low position so that top of pan will be in center of oven. Heat oven to 350°F. Grease bottom only of an 8x4-inch loaf pan. In a large bowl or the bowl of a stand mixer, whisk together flour, baking powder, baking soda, salt, ginger, pumpkin pie spice, cardamom and nutmeg. In a separate, medium bowl, combine brown sugar, banana, molasses, buttermilk and oil. Pour wet ingredients into dry ingredients and stir with a wooden spoon (or paddle attachment) until just combined. Pour batter into the loaf pan and bake about 45 minutes, or until a toothpick inserted in the center comes out clean. Cool loaf in pan for 10 minutes, then cool completely out of loaf pan on a cooling rack. When fully cooled, prepare icing; in a small bowl, whisk together powdered sugar, heavy cream and lemon juice until smooth. Pour through a sieve into another small bowl. Carefully pour icing over loaf (with a plate or parchment paper underneath to catch the extra drippings). Cool in refrigerator for 1 hour to allow icing to set before slicing. We challenged Tablespoon bloggers to choose a classic recipe from the "Heirloom Recipes and New Twist" section of the brand new Betty Crocker Cookbook and throw down their own spin to share with you. 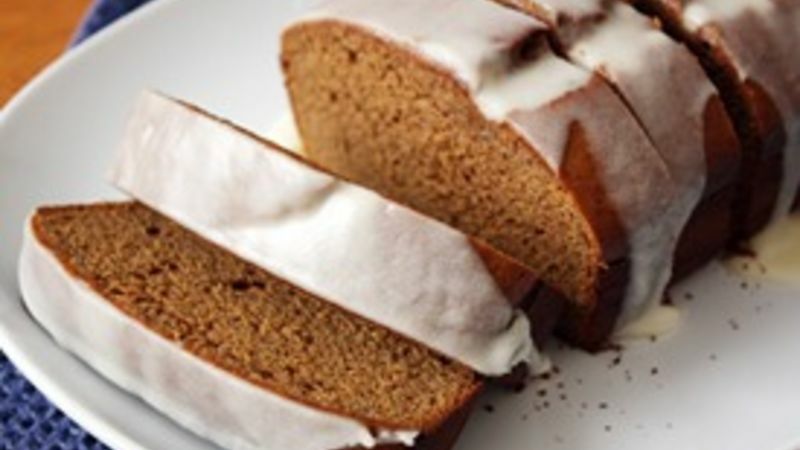 Today's twist: Banana Gingerbread with Icing, Smwise's version of Betty's classic Banana Bread recipe. My mom and dad are both excellent cooks in their own ways. My mom has an arsenal of delicious tried-and-true recipes that, no matter how busy we were growing up, brought everyone to the table with eagerness to devour what was on our plates. My dad, on the other hand, is one for experimenting in the kitchen – as a chemist, this is unsurprising. He’ll find an exotic recipe and make it even more unique with a dash of this, a dollop of that, etc. until he renders the perfect result. His creations, too, were yummy and helped us discover new flavors. I like to think my cooking and baking methods are an amalgam of that of my parents’. I love developing my own classic recipes that, no matter how often I make them, bring smiles and fill hungry stomachs. But I also like to incorporate creativity into recipes, just to see what happens. Take this Banana Gingerbread with Icing, for example – just like the original banana bread recipe has been an enduring favorite in the Betty Crocker Cookbook since the 1930s, it has also been a staple in my mom’s rotation of recipes. But, true to my father’s culinary form, I decided to take things a bit left field and add extra flavors to the traditional quick bread recipe. The flavors of homemade gingerbread are an excellent counterpart to banana – ginger and banana are just meant to be together. There also is a hint of that strong molasses flavor that blends well with the creaminess of banana and buttermilk. And of course, who can deny anything with a sugary, drippy icing on top? It’s a dead giveaway for a winning recipe. Whether you’re in the mood for a traditional, classic quick bread or a new, inspired twist, this banana gingerbread is a great recipe to fuel those creative juices in the kitchen.